SUPER HEALING By: Elaine R Ferguson M.D. This is a 40 day Action Plan to help you better your health, what is more important then spending 40 days out of your life to find out how to get your health better? Elaine will help you do just that chapter after chapter there is help on the way. So please take time to read this book and see how much better your health can be, you can’t loose can you? Everyone want to stay healthy right now is a good time to start with the new insurance kicking!!!!!!!!!!!!! One thing I can’t do is handle stress— I am at the top of the list for stressed out!!!!!!! I stress if one of my kids get hurt and they are in their 40’s or if anyone of my 10 grandchildren gets hurt or my great grandchildren. I may not say anything to them but I feel it inside and I get worked up. Are you that way? Elaine said stress contributes more than anything to diseases — great I lived with stress for 65 years— well ok maybe I never lived with it for 65 years but at least 50 years ok????? I have to learn that since it is probably the cause of anything I might have– or get it is a good time to start today to take steps small steps at first buy none the less steps to put stress as far back on the top shelf that I cannot reach it — and pretty soon stress will not exist for me. This is the book that will help you concur or at least get you help to get rid of a lot to get better health. 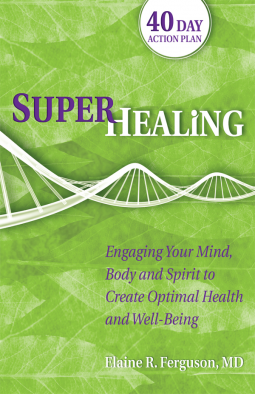 This beautiful book tells of our –Super Healing Mind– so if we start with our mind first then work to our Super Healing Body, our Spirit and then Your Life Style. Engaging your mind, body and spirit to create optimal Health and Will–being Elaine says. This is a the 40 Day Action Plan. Ready to see some of it? Chronic-stress makes it virtually impossible to maintain homeostasis. Stress response is triggered on by going and unsolved anxiety, fear, tension, anger, and sadness. This shuts down the digestive and immune systems. This weakens our body to ward off infection. On page 56 of this powerful book– tells of Deep Connections between stress and Disease — great chapter! Then there’s a part in this book for positive Psychology chapter on your Super healing Spirit. This book is full of all kind of wonderful information to help get you out of a DR. office and into a life that will help you keep yourself well. Lots of powerful information, lots of great chapters. Wake up calls that are great for you. I recommend this book highly. Get it to help your mind, spirit and your life your body will love you for it. Let your Super Healing Light Glow!!!!!!!!!!!!!! I received this beautiful book free from HCI for an honest review. I was not required to write a positive review just an honest on. The opinions I have expressed are totally my own and no one else’s. Thank-you Lori for believing in me. May God always be with you.